Ariandel, being the restorer of the Painted World, knew that it was painted with blood, and only blood could protect the secret. He is bound and tied to a chair where he sinks his head inside a large Lordvessel-like bowl, which he uses as a weapon. 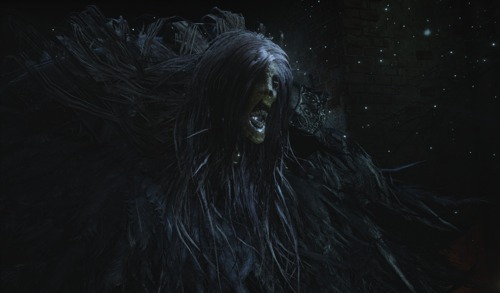 "Bring Friede to me, please." A flail used by the bulbous Father of the Painted World to shred his own skin, producing blood to appease the flame. Both a weapon and a miracle catalyst. Violently flail oneself to trigger an awakening that temporarily boosts the strength of miracles, just as the good Father used the rose himself.